If I happen to find Kashmiri Pulao on the menu, I'd look no further and order it right away. I have fond memories associated with Kashmiri Pulao and my mom loves it to the core. Way back in Vizag when I was like around 8, every sunday we would routine to Green Park Hotel. Our frequent order was Kashmiri Pulao served in a pot. Steaming hot Kashmiri pulao... I still remember that aroma and taste. I used to wait for Sundays just for this Pulao. I asked my mom to prepare this at home but she always thought Kashmiri Pulao was something that was not so easy to prepare. She felt that Kashmiri pulao was limited to restaurants only. Current - I was discussing with my colleague on easy peasy rice recipes which do not involve much chopping and elaborate methods considering the time crunch. Oh boy, I just had a shift change wherein my shift got advanced by 2 hours. Can you imagine my plight of getting early, running and cooking? 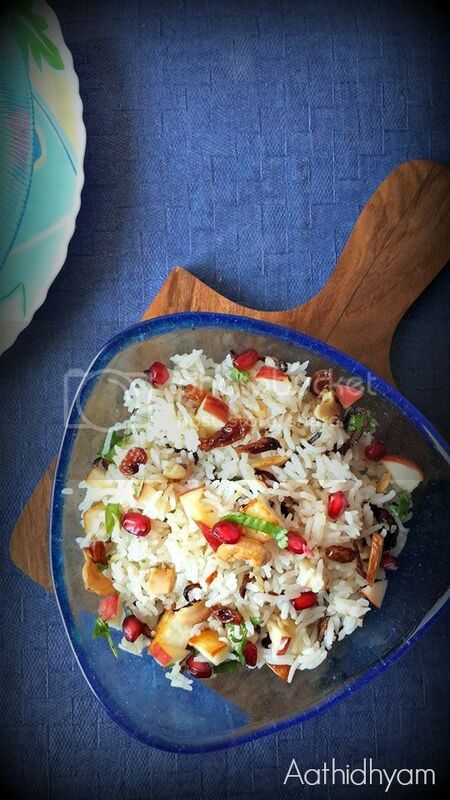 We made a list of rice recipes like Jeera Rice, Schezwan Rice, Fried Rice, Tahari, Aloo Bhendi Cashew rice, Navratan Pulao and Kashmiri Pulao.... I was like are you sure about Kashmiri Pulao, she confidently told me that I can dish it up in flat 2 hours. I must admit, she was right. I found this recipe in a local magazine and it's a keeper. 1) Heat ghee in a heavy bottomed pan and throw in all your whole spices one by one. 2) Fry for a min or until they are fragrant. 3) Add Milk and water to this mixture. 4) Allow it to come to a boil. Now add washed rice. Add salt and sugar as well. 5) You can either pre soak it for 30 mins or add it just like that. 6) Cook rice until done. I transferred the entire mixture into electric cooker and cooked rice. I'm somehow not so confident about cooking rice in a pan. I mushed it up many times or burnt it. I wanted to play safe considering the time constraint. 7) Once rice is cooked, allow it to cool and then fork it up. 8) For golden fried onions, thinly slice 1 medium sized onion and fry until golden brown. 9) In a pan, heat oil/ghee and fry paneer pieces until golden brown. 10) Fry cashews, raisins and almonds separately until golden brown and keep them aside. 11) You can discard whole spices from rice. I don't like them in my rice so i do it. You can choose to ignore this step. 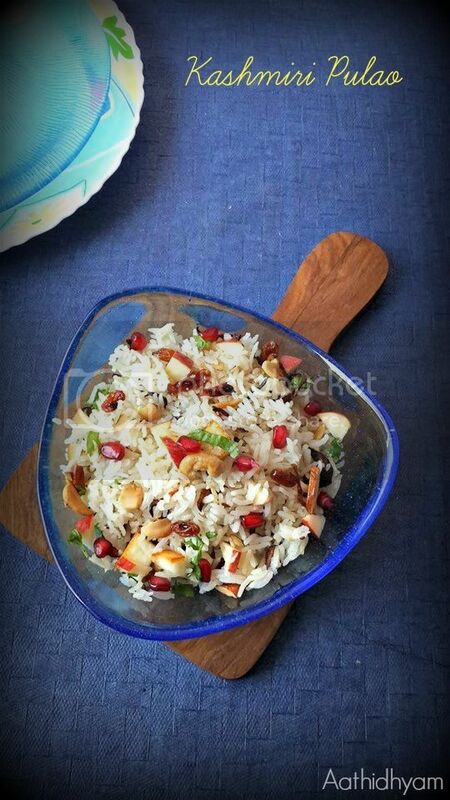 12) In the same pan, add rice and dry fruits, onions and coriander. Mix everything well. Allow it to cook for 2-3 mins. 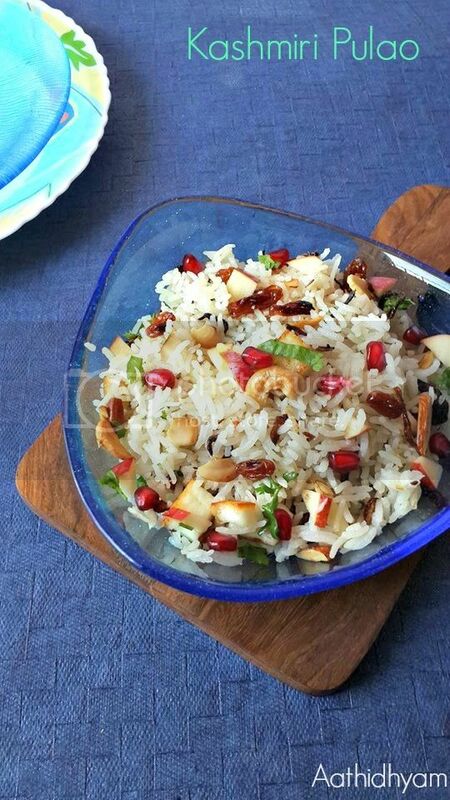 13) Add coriander, paneer pieces, apple and pomegranate seeds just before serving. 1) You can even use pineapple pieces and grapes. 2) Rice needs to be separate and grainy. So please take care while cooking rice. 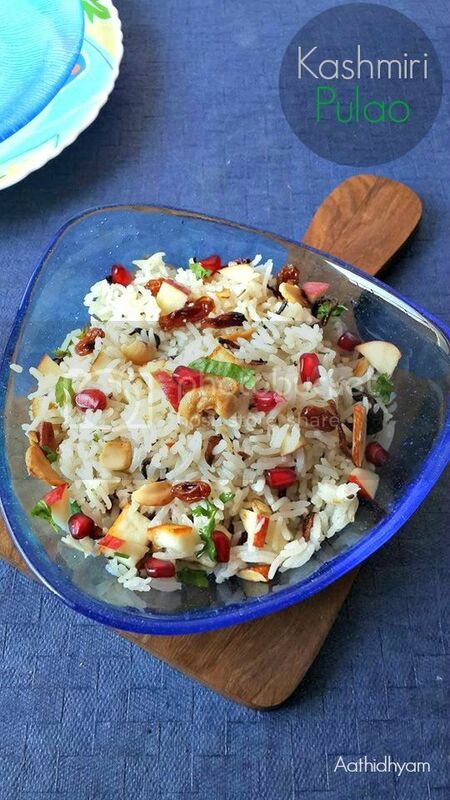 3) Kashmiri Pulao is mild and sweet. You can serve it with a spicy gravy based curry or eat it just like that.